ProChannel features a collection of audio processing modules that can be dynamically added, removed, and reordered per audio track, Instrument track and bus in the Inspector and Console view. Combining compression, equalization, tube saturation modeling, console emulation, tape emulation, and convolution reverb in one convenient processor, ProChannel is designed to make it fast and easy to enhance any track or bus. Figure 411. ProChannel provides compressor, equalizer, tube saturation, console emulation, tape emulation, and convolution reverb processing for each channel. PC76 U-Type Channel Compressor. This is the default mode when using ProChannel on a track. This mode is meticulously modelled after one of the most renowned and famous solid-state (F.E.T.) compressors that is used in professional studios and recordings. Known to bring out the brightness and presence of a sound. Commonly used on vocal tracks, but also recommended for stereo drum buses and guitar tracks. For details, see PC76 U-Type Channel Compressor module (Platinum only). Note: The PC76 U-Type Channel Compressor is faithfully modelled after the hardware circuitry of a classic compressor that does not support sidechaining. Consequently, the PC76 U-Type Channel Compressor does not support sidechaining either. If you need to use sidechaining, use the PC4K S-Type Bus Compressor mode. PC4K S-Type Bus Compressor. This is the default mode when using ProChannel on a bus. This mode is based on the legendary center console stereo bus compressor in one of the world's most successful analog studio production mixing consoles. Known to add punch and drive to a mix. Also recommended for instruments like piano and drums. This mode supports sidechaining. For details, see PC4K S-Type Bus Compressor module (Platinum only). QuadCurve Equalizer. The QuadCurve Equalizer module allows you to fine tune the frequency spectrum of your music or sound. You have control over six individual bands, which allows you to attenuate or boost specific frequency ranges and shape the overall characteristics of the audio signal. Equalization may also be applied creatively, to add presence or enhance certain frequencies, to remove noise, hum or low-end rumble, for special effects or numerous other purposes. The QuadCurve Equalizer fly-out panel also includes a real-time FFT spectrum analyzer. For more information, see QuadCurve Equalizer module. Tube Saturation (Platinum only). Digital audio recordings can sometimes sound sterile and lifeless. The Tube Saturation module employs advanced analog vacuum-tube circuit modeling, which allows you to apply ultra-high-quality analog warmth and saturation to individual tracks and full mixes. Under the hood are dynamic, virtual vacuum-tubes that mimic the “animated” nature of their real, analog counterpart as they respond to different audio input. The result is the coveted warm, lively and realistic analog sound of classic vacuum-tube processors and amplifiers. For details, see Tube Saturation module (Platinum only). Softube Saturation Knob. The Softube Saturation Knob module borrows from Softube’s famous German FET distortion and compression circuitry modeling, and provides smooth, one-knob, frequency saturation operation for adding just the right amount of tube warmth to any track. For details, see Softube Saturation Knob. Console Emulator (Platinum only). The Console Emulator module emulates the sound of three classic recording consoles in SONAR's mixer. For details, see Console Emulator module (Platinum only). FX Chain. The FX Chain module lets you save and load audio effect plug-in chain presets called FX Chain. The FX Chain module can be used as an FX Rack that can be inserted between other ProChannel modules. For details, see FX Chain module. BREVERB SONAR ProChannel (Platinum only). The BREVERB SONAR ProChannel module by Overloud provides world-class studio reverb. 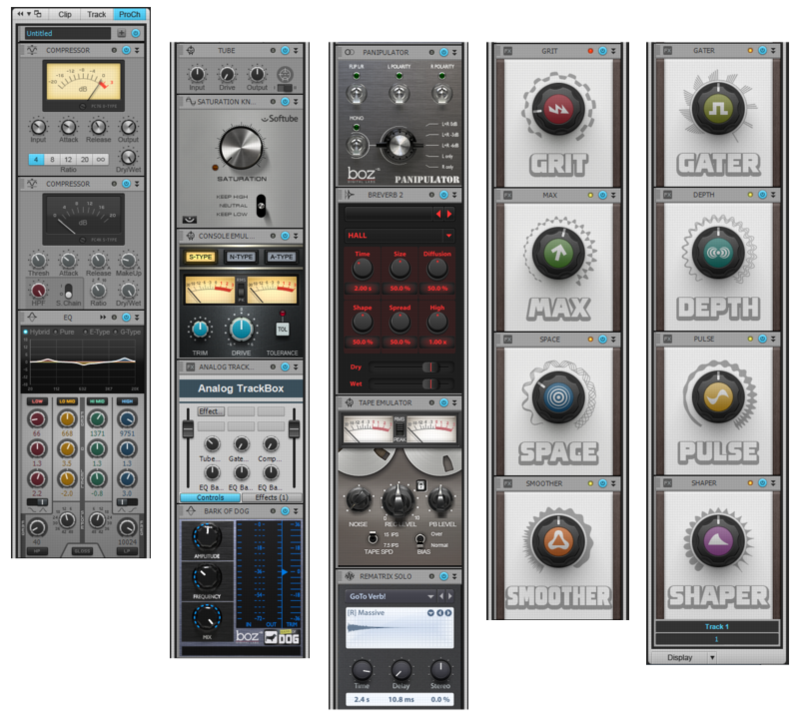 Dozens of professional presets are included. SONAR includes both VST and ProChannel versions of BREVERB SONAR. For details, click the Help button in the BREVERB SONAR VST version. Tape Emulator (Platinum only). The Tape Emulator module by Overloud lets you add the warmth and richness of analog magnetic tape saturation to your digital mixes. For details, see Tape Emulator module (Platinum only). REmatrix Solo. The REmatrix Solo module by Overloud is a world-class convolution reverb that includes 100 impulse responses (IRs) designed by MoReVoX. You can also import your own IRs and control the EQ, length, delay, and stereo field of any single IR. REmatrix combines the high fidelity of a convolution reverb with the flexibility of an algorithmic reverb. The included presets were created in real mixing sessions, and are ready-to-use for music production/mixing. For details, see REmatrix Solo convolution reverb. Bark of Dog. The Bark of Dog ProChannel module by Boz Digital Labs is a high-pass filter with resonance that can add lots of energy to the low end of a track. It lets you boost the low end while still keeping it under control. For details, see Bark of Dog. Panipulator. The Panipulator ProChannel module by Boz Digital Labs lets you simulate how your stereo mixes will translate to a variety of stereo and mono configurations. Check the mono compatibility of your mixes and identify various problems in the stereo field that are not always obvious when listening to proper stereo monitors. For details, see Panipulator. GRIT (saturation). Digital audio recordings can sometimes sound sterile and lifeless. The GRIT module provides smooth frequency saturation operation for adding just the right amount of tube warmth to any track. Dial in anything from warm tube sound to more of a modern amp overdrive. For details, see GRIT (saturation) module. MAX (volume maximizer). The MAX module is a one-knob volume maximizer that transparently increases the overall sound loudness of a track or bus by reducing the dynamic range. Use MAX as a convenient track leveler and compressor. For details, see MAX (volume maximizer) module. SPACE (reverb/ambience). The SPACE module adds reverb/ambience to the audio signal. Simulate environments from small rooms to huge halls. The space gets increasingly larger as you increase the knob value. For details, see SPACE (reverb/ambience) module. SMOOTHER (de-esser / de-harsher). The SMOOTHER module is designed for vocals and guitars and removes sibilance or harsh frequencies without losing presence. For details, see SMOOTHER (de-esser / de-harsher) module. GATER (remove noise). The GATER module is a simple noise gate for removing unwanted noise in a track. For details, see GATER (remove noise) module. DEPTH (chorus / stereo shaping). The DEPTH module adds a lot of space and makes the sound feel wider and bigger. For details, see DEPTH (chorus / stereo shaping) module. PULSE (tremolo). The PULSE module adds an auto volume swelling effects, and at higher settings gets a bit of saturation and modulation. For details, see PULSE (tremolo) module. SHAPER (transient control). The SHAPER module lets you shape the audio signal’s attack phase independently of the decay/sustain phase. For details, see SHAPER (transient control) module. Additional modules will be available in the future from Cakewalk and third party vendors. For help with external ProChannel modules, select a module and press F1 to open its online Help. To show/hide ProChannel in the Console view, click the Modules menu, then click ProChannel. To show/hide ProChannel in the Inspector, click the ProCh button at the top of the Inspector, or press CTRL+I. 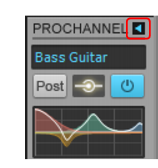 Note: Due to technical limitations of the VST plug-in format, it is not possible to show more than one instance of a ProChannel module. As a result, the same ProChannel instance can not be displayed in the Inspector and Console view at the same time. If you open ProChannel in the Inspector, the same ProChannel will close in the Console view, and vice versa. Click the Expand/Collapse button in the Inspector or Console view. To close all instances of ProChannel, hold down the CTRL key and click any Expand/Collapse button . Note: When expanding ProChannel in the Console view, ProChannel extends to the right of the channel strip.